This post is for our fallen friend, Lisa Kelly. My words will be short because I want Lisa's words and the words of her best friend, Kim Tracy Prince (@kimtracyprince on Twitter), to do the talking. I met Lisa in the virtual world where we served as support and motivation for each other. My wife was battling cancer. Lisa was battling cancer herself. Once you know cancer, there is an instant bond with those that know and have shared the pain. I was proud to know Lisa and blessed to finally meet her in Palos Verdes where I was attending a Team in Training practice to share my story of loss that lead to a story of hope. That is why I think I instantly bonded to Lisa. She epitomized hope. Cancer knocked on her door. She knocked it down and through it all came out with a big smile that her friends know so well. 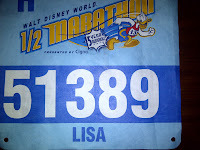 I was part of a small group of people that helped motivate Lisa to attempt her first half marathon with Team in Training. This is a big step for anyone but an even bigger step of faith for Lisa because when cancer attacked her.......it attacked her ankle and feet. Running was painful for reasons you can read below but she put her trust in others that she could cross the finish line. She had beat cancer. She was pushing through the pain and I am certain that on January 7, 2012 she would have fulfilled her journey and crossed the Walt Disney World Half Marathon finish line...........perhaps in pain but undoubtedly smiling big. On November 3rd of 2011 this all changed because Lisa passed away of natural causes. Lisa's journey ended. God had other plans. I will never leave a fallen comrade behind. When John read these words, he thought of Team in Training and how that is what we all do every day. We place the mission to beat cancer first. We will never accept defeat nor quit until cancer is a thing of the past....a chapter in the history books. This we must do because we will never leave a fallen comrade behind. We will not let one single person touched by cancer be forgotten and will fight hard for those currently affected. I and a group of friends, immediately started spreading the word on Twitter that although Lisa Kelly had passed, her fundraising page lived on. When those messages hit the virtual world, Lisa was shy of having raised $3,000 but well on her way to her $4,500 fundraising goal. Within days her fundraising total had reached $7,000 and today that total sits at $17,000. This is an amazing testament to the person Lisa was.......the inspiration she provided while here.........and the legacy that will continue to live on long after she has passed. As Kim Tracy Prince confirms below.......it is also a testament to hope. Tomorrow is January 7th. At 5:30am, the gun will go off and while Lisa Kelly will not physically be running the Disneyland Half Marathon......her journey will be completed. Eric Orvieto (@eorvieto on Twitter) and I will be carrying her bib for 13.1 miles to make sure we finish what she started. She exercised faith in us. We told her we would get her to the finish line. Tomorrow we will do just that. The fact that Lisa Kelly is being honored tonight is a testament to hope: hope that there is goodness in people, hope for the strength of the human spirit, and the hope that love endures beyond the limits of our physical bodies. Lisa started training for this race less than a year after surgery on her left foot to remove a recurring tumor. It was the second such operation she had, and also the second time she recovered with remarkable speed and determination, setting aside self-pity and competing in athletic events to prove to herself that she could beat cancer. 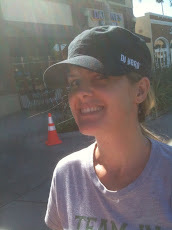 This weekend was to be her first half-marathon. Her training was coming along nicely even while her foot was causing her great pain as the nerves healed within. Lisa was healthy, happy 40 year-old woman who was very much looking forward to this event. However, Lisa passed away on November 3. Her cause of death was natural but as yet undetermined. At the time of her death, Lisa was well on her way to her fundraising goal of $4,500. She was able to gather support from every community she touched - as a physician, she had a large base of support from the medical community. Her family and friends, who witnessed Lisa's incredible and inspiring journey from cancer patient to triathlete, were among her greatest supporters. She also gathered the admiration of strangers worldwide by telling her story on her blog and using Twitter and Facebook. News of Lisa's death spread via personal message and internet updates, and within ten days her fundraising goal had been reached and surpassed. Because of the power of Lisa's story, friends, family, and strangers alike have donated money to this cause. As an driven professional, Lisa had allowed physical fitness to take a back seat in her busy life. She was a neonatologist at Children's Hospital in Los Angeles with a grueling work schedule that included a swift rise up the ranks, the lead on an ambitious national database project, and a commitment to the advancement of international medicine. She regularly traveled to foreign countries to aid medical workers in destitute communities. At home, Lisa made time for her family and friends, never passing up the opportunity for a fun adventure if she could fit it in between work commitments. She was physically active, but not focused on her own health. In 2007 Lisa was diagnosed with round cell myxoid liposarcoma in her left ankle - basically, a cancerous tumor on the nerve in the inside of her left foot. Initial treatment options included amputation - a horrifying notion to an active woman who considered herself unlimited. Her course of treatment eventually consisted of surgical resection followed by radiation. The treatment left Lisa in a wheelchair, with months of physical therapy and a complete redefinition of the life in front of her. The prospect of such a thing happening is daunting to even the most active people, and the event certainly did give Lisa pause and lots of time to feel sorry for herself. But something happened. Lisa's grueling work with her physical therapist transformed her. She became obsessed with her progress, changing her diet and her lifestyle to maximize the healthy changes in her body. In that year, Lisa lost 75 pounds, regained her ability to walk, and decided to compete in a triathlon. After surgery and radiation that would have left most people barely able to walk within a year, Lisa completed that triathlon and became a true athlete - a person for whom physical activity was not just helpful, but necessary to her very spirit. Lisa loved the rush of running, biking, and swimming. She craved exercise, even leaning on it to get her through emotional stress. Training was like therapy for her mind as well as her body. It was only fitting that she chose to compete in races for fundraising purposes as well. She was a very giving person, who used competitions as opportunities to educate and inspire everyone around her. Lisa did not often dwell on the cancer in personal conversations. She preferred to keep her fear and suffering to herself. It was through her workouts and her goals of competition that she felt she was beating the cancer, that she was living her commitment to thrive, not just talking about it. In a way, as she wrote on her blog, although she never would have welcomed it, the cancer was a blessing, because her life was better after having gone through it. In its infuriating way, the cancer came back to Lisa's foot in late 2010. This time her treatment was more invasive - in addition to the tumor, part of the very nerve that gave feeling to the bottom of her left foot had to be removed. She was left with a numb foot, and far less mobility than after the first surgery. But this time Lisa's body was in much better shape to withstand the trauma of surgery and followup therapy, and by then she was addicted to exercise. Within days of the operation in January of 2011, her occupational therapist approved Lisa to do chair workouts. Within a month she was up on crutches, and soon she announced her commitment to compete in a triathlon only 8 months after surgery. On the way to that event, Lisa signed up with Team in Training, a group that brought her something she didn't even realize she wanted: a new family. In them Lisa found people who were as fanatical about training as she was, and who were there for many of the same reasons. This is a quote from her blog:...it's not just about the races, the athleticism. I want to give back to the cancer community that has supported me. I want fewer people to know this pain and fear. I want cancer in all its forms to become treatable, for fewer people to die. Raising money for Pediatric Cancer Research as a part of the Malibu Tri, raising money for the Leukemia and Lymphoma society as a part of training for the Walt Disney World half marathon - somehow this makes sense to me. It feels right. I chose to give back rather than kick, scream and cry. (Though, I've done that too). When someone dies, we want to kick and scream and cry, and we do that, but then we need something else to do. Many, many people directed their grief and anger to Lisa's Team in Training website and donated money so that her training would not be in vain. Because people all over the world feel her absence, Lisa's efforts will still help cancer patients, and not just right now. Even after years pass and Lisa Kelly's name is not on our lips every day, the work she did during her life will continue to silently, thanklessly help people. She may not be here to run in the race this weekend, but Lisa's shining energy that made people so happy will be carried on by her training comrades. This honor is not only for Lisa, but also for the spirit of hope that she represented. If this astounding fundraising success can happen because of one person, think about the power of what you are all doing. Lisa showed us that there is hope for us all.